« Day 334 – Tyler S.
Before I get to today’s recipient, I need your help to find two things. First, I need a couple of people who are out of work who would be willing to take the same challenge that I have done this year for a week or two. In other words to go out and give $10 away every day and then blog about it on the Year of Giving. If you or someone you know wants to do this, please email me. The other thing is that the Year of Giving is expanding! We need a part-time intern for next year. Someone who is a little web savvy and can dedicate about 10 hours a week to the project. It doesn’t need to be for the entire year, but at least a 6 month commitment. It will be an amazing experience, trust me. Any interested people should get in touch with me ASAP and tell me why you should be chosen. Now…on to today’s recipient. This is really embarrassing yet it was bound to happen at some point. 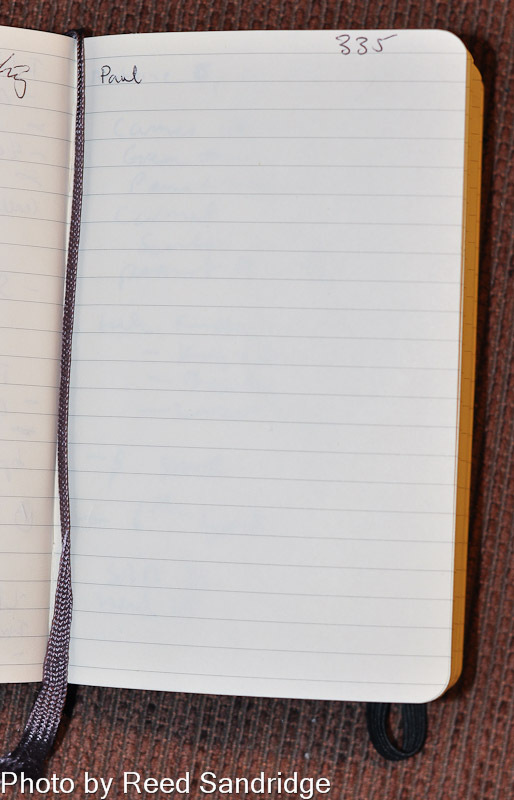 I opened my journal up to the page marked Day 335 and there was nothing written there except the name Paul. I had no idea who Paul was or where I met him. How is this possible? Then I went to look at my photos and figured out the photos immediately after Tyler were probably of Paul. Bingo! I was right. I remember him now, he was a bike messenger I met on Columbia Road in Adams Morgan late one Sunday evening. But where are all the notes about Paul? How old is he? What is his email? What the heck did he do with the $10? Hmmmm…I don’t know. I know I wrote them down some place but I didn’t have my trusty Moleskine on me apparently. I do have a video though…although it doesn’t tell too much either. Paul powering up on some beverages at CVS. I ran into Paul in front of the CVS that is next to the Safeway. He was getting some beverages to take down to a restaurant down there street where his brother was waiting for him. He had heard of the Year of Giving and was very friendly. I told him about my losing my mother and he shared that his father had passed around this summer. He talks about his dad and their relationship in this clip. It’s clear that this was not easy for him to talk about. Other than that, I can’t recall much. The last couple weeks have been a complete blur. I think he is in a band or DJs or something…who knows. Hopefully I will find the little piece of paper where I jotted all the notes down. And if anybody knows Paul…tell him to get in touch! So I was doing some new year cleaning and found the paper where I wrote down the info on Paul! When I met him he told me, “I’m coming back from a show that I didn’t go to.” That kind of perplexed me, but then he explained that he went to a show where the band didn’t play. “I ended up buying some CDs of the band,” he said referring to the metal band that calls themself Body Cop. Paul is no stranger to music. He plays bass and drums and even does some producing. I asked him about musical influences. “I’ve been inspired by so many but Brian Wilson, Myles Davis and Frank Zappa for sure.” He has a website where you can listen to some of his work. “I’m going to use the money for food,” he told me. “I’ve been trying to conserve money lately.” He said that he was lucky to have a job and enjoyed the flexibility of being a courier. When we parted he said to me with so much enthusiasm, “It was really cool running into you.” The feeling was mutual. It is easy to see how this could happen. Hopefully someone will recognized him and fill in the details! Would you believe I ran into him on the street last week!? Small world. Thanks for your note!